What was once one of America’s most polluted cities (US News and World Report, 1979) is now using locally recycled organics and compost erosion control socks in downtown redevelopment and urban renewal. For Chattanooga, like most cities with a heavy industrial background, the Tennessee River was seen as a liability instead of one of its most valuable resources. Over the years, the efforts to clean up the river and the surrounding areas have resulted in a resurgence in the downtown area. Enterprise zones for redevelopment have allowed businesses to come into the area and expand by utilizing poor sites and those needing cleanup. The Living Wall weeks after installation adjacent to the Chattanooga Riverwalk. One key ingredient that has led to Chattanooga’s downtown revitalization has been the effectiveness of public/private partnership. In many mid-sized cities, either public or private initiatives prevail over the other with the usual strings attached. In Chattanooga, the community has not only allowed, but embraced these public/private partnerships as a means to sustainable development. Since the urban renewal program began, property values and general activity in the downtown corridor have increased. The centerpiece of the riverfront is the Riverwalk, a 22-mile public walkway next to the Tennessee River. The Riverwalk has offered residents and visitors to Chattanooga a unique opportunity to enjoy the river, but some problems still exist with adjacent property that are the result of years of erosion. 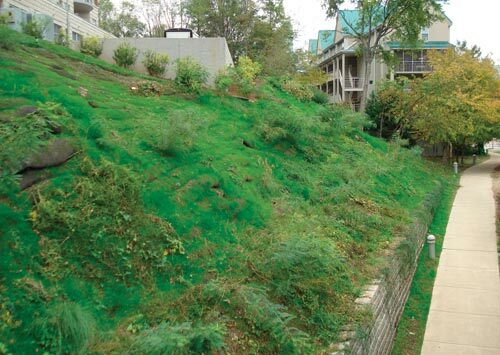 Earthscapes, a Chattanooga company, was preparing to install a seeding project for a new condominium complex when the opportunity for expanded scope of work was realized. 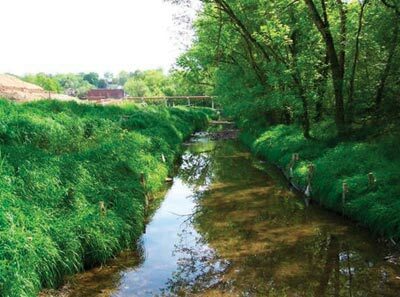 “We were simply seeding an area using compost when the owner of the complex asked if we could also help with the banks leading down to the river”, explained David Ramsey, President of Earthscapes. “The slopes had deteriorated due to the failures of several different solutions and other products used there. 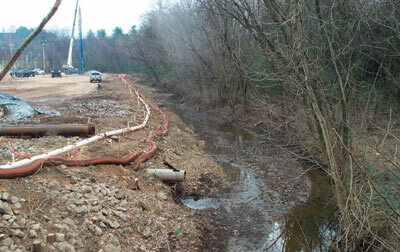 The soil was about as poor as we have in the area, so vegetation establishment was a challenge,” said Ramsey. "This technology enables us to build a wall of organic materials that are staked in, stable, vegetated, and allow for reduced erosion while increasing vegetation," said Ramsey. The same company already helped manage the City’s yard waste and composting facility and knew about the benefits of adding compost products to amend the soil to foster healthier plant growth. As Ramsey inquired about the issues at the condo slope, it developed into a cooperative effort between several shareholders, including:TDEC, the City of Chattanooga, EMJ (local contractor), River City company (sustainable development non- profit), & Windsor Autrey (South Carolina developer), who, instead of working separately, decided there was more to gain by working together. The condo project became a focal point for using locally-recycled and composted products together with technology called a ‘Living Wall’ from Filtrexx. “This technology enables us to build a wall of organic materials that are staked in, stable, vegetated, and allow for reduced erosion while increasing vegetation”, said Ramsey. Installation of the Living Wall by the Earthscapes team led by Richard ZarZour. The condo project began by cutting down the hackberry and other noxious weeds to prepare the slope. 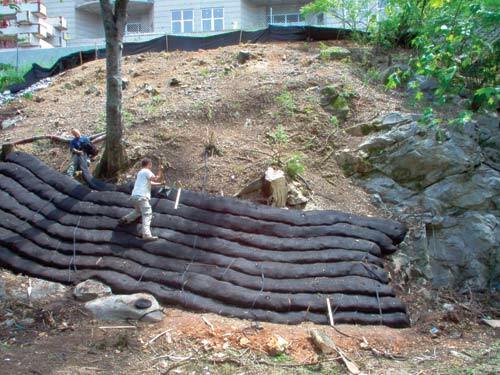 Once the slope was accessible, installation of the Filtrexx ‘Soxx’, which are compost filled mesh tubes, began, starting with the bottom row. As each row was installed, the installers were able to actually stand on the layer below sequentially, until they reached the top of the hill. In some parts of the slope, where angles are 1:1 or greater, they needed to tie off with repelling gear to maximize safety. The project was a total of 14,000 square feet, and due to the location near an over pass, it was very hard to get to. Yet, because of the visibility of this site, from driving access on the highway, the walkway on river walk, and the condo complex balconies, the aesthetic appeal of creating a green lush area was as important as the reduction of the erosion. As layer upon layer were added, they were planted with the live stakes of choice. As each layer is added, the tubes have a tendency to compact relative to the walking and natural compaction from the workers. This firms up the materials inside and creates an excellent seedbed for vegetation establishment. The compost socks completely cover the bare slope, so erosion of the slope is nearly impossible because water cannot impact directly. As seeds germinate and roots grow, they eventually penetrate the back layer of the socks and root into the slope substrate. All of this happens within a 6 mos -2 year timeframe. Grass is used mostly as a nurse crop and to help choke out other concerns with blown in noxious weed seeds or those coming from avian or rodent sources. In about 2 years, once the dogwood and other bush species take over, the grass will take a secondary role in overall vegetation prominence and fades into the backdrop. 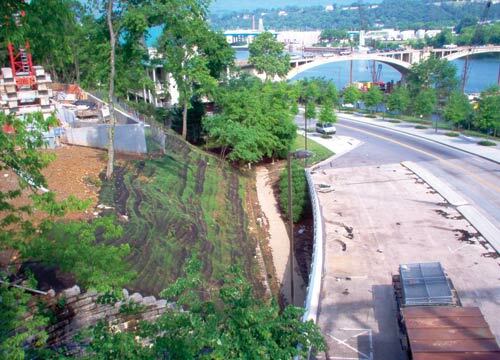 Typical eroded stream bank in Chattanooga�s Renaissance Park (former Roper Industrial Site). Stream reclamation three months later (note clarity of the water). During the meetings for the project, the installers discussed planting options with the City Forester Gene Hyde, and decided on using a nurse crop of grass within the tubes followed by plantings of Yellow and Red Twig Dogwood & False Indigo Bush. “A great advantage to using this flexible technology is that we actually work with nature…we work with what is there already”, said Ramsey. “So many other technologies require complete destruction of any trees or desirable bushes that it would actually cause concern for slope stability”, he said. “Keeping some of these larger trees here is a great strategy for the next 20 or more years”. These new plantings are native to the area and will naturalize the slope for visual effect and protect if from further erosion for years to come. The project took a total of 7 days to complete. Although the gravity of the slope should not be enough to make the Soxx fall down, anchors were used with a special tie in system to make sure areas of the wall system were secure. 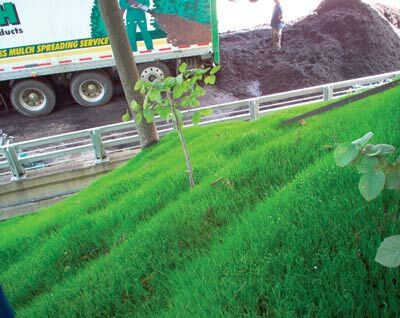 “Once vegetation grew in and grass germinated, the roots of the grass acted like Velcro on the banks of the slope, and I don’t think we could have pulled them out if we wanted to”, said Randy Wharton, Vice President of EarthScapes. “The anchors were for additional support and are put there for long term stability. Once the vegetation canopy is established, they simply keep everything secure”, he said. Nurse crop grasses with live stake trees planted in Filtrexx Soxx. Because of these projects, the installers have been awarded a City Requirements contract for any city property or department for single source erosion control that uses locally produced organic products. Part of the Greenscapes initiative, Buy Bio, LEED, and other sustainable development programs have focused on using ‘green alternatives’ on existing projects. Since compost is locally made, annually renewable, bio-based, organic, recycled and natural, it fits the bill for any city to consider. Especially when most cities don’t know what to do with their compost products. There now has been several projects at or near the river walk and they include: using filtering applications instead of a sediment pond, which uses compost socks to slow water down and filter it in a maze format; rip rap greenscaping, which is filling rip rap with compost and seed to cover the rock and return wildlife habitat to the water’s edge; and compost blanket with a coir mat in place of rip rap. 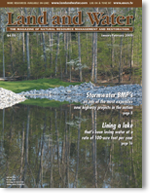 In addition, EarthScapes has partnered with local construction company, Stein Construction, to build a number of erosion and sediment control designs and have several similar projects planned in the near future. Because of the proximity of these projects downtown, around the waterfront, they serve as a field laboratory for sustainable development and the beneficial use of organics and manufactured products in urban revitalization. For more information, contact Rod Tyler, Filtrexx International LLC, (440)926-8041 or e-mail: rodt@filtrexx.com.